Vikas Sahyog Pratishthan (VSP) works with marginalized communities in rural Maharashtra and helps them restore their dignity by teaching them livelihood skills. VSP works with diverse communities such as tribals, Dalits, nomads, de-notified tribes, landless farmers, marginal landholders and agricultural laborers. VSP is managed by a group of social activists who support the poverty-struck landholders and farmers attain their property rights and government entitlements. After 2005, VSP developed a team of strategists who helped them streamline their operations and act in a focused manner. Today, VSP works with 27 community organisations and its main focus is to create sustainable livelihoods for the aforesaid communities and work for women empowerment. 315 nomadic families managed to receive ration cards and food entitlements, 400 received voting cards and 254 individuals could obtain their caste certificate through VSP’s effective advocacy and facilitation in FY13. About 1,400 individuals were assisted to receive employment under Mahatma Gandhi National Rural Employment Guarantee Act. Training in basic computer literacy was provided to 820 young adults. Around 500 migrant children were admitted to local schools and accommodated in a nearby hostel. Capacity building sessions were held with 800 women farmers, 17 Gram Panchayat members and 22 government officials. Training sessions were conducted in areas like organic farming, multiple crop farming, and crop cultivation (other than paddy). While working with the Maharashtra State Government on ‘Conversion of Agriculture Interventions in Maharashtra’ project, VSP supported 25 village Gram Sabhas in Amravati district to elect Village Development Committees. VSP also supported these Gram Sabhas to design development plans for their respective villages. VSP posted a total income of Rs14mn in FY13; up by 33% YoY. 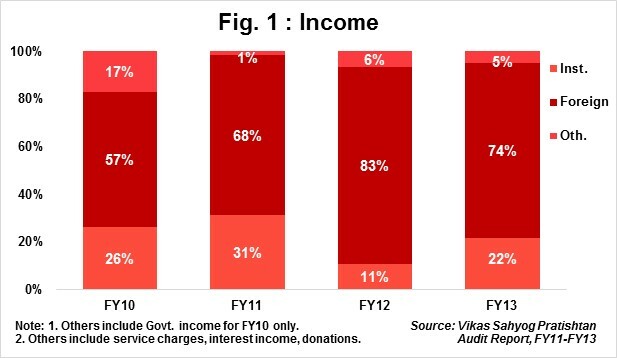 The rise in income was owing to 166% YoY growth in grants received from institutional agencies and 19% YoY growth in donations from foreign sources. Contribution received from foreign sources continued to remain the major source of funding since FY11. In FY13, foreign contribution was to the tune of Rs10.6mn (+19% YoY). Rs14mn was spent in FY13 on program cost, staff salary, travel, and all other operational costs. No breakup of total expenses was highlighted in the audit report for FY10-FY13. After three consecutive years of recording losses, VSP booked a small surplus of Rs0.3mn in FY13, which was transferred to the Balance Sheet to reduce the accumulated deficit which was Rs1.5mn prior to this adjustment. Earmarked Funds at the end of FY13 stood at Rs2.9mn. Earmarked funds have been set aside for education, awareness building on various themes and for natural calamities like drought and flood. 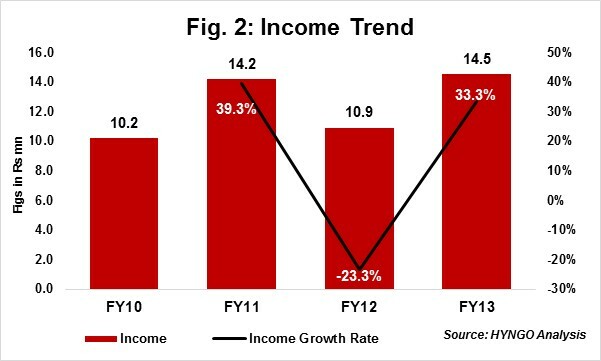 VSP’s YoY income growth has been erratic in past four years (Refer Fig. 2), thus posting a 4-year income CAGR of only 13% during FY10-FY13. This is because some of the funding agencies are now focusing on urban areas rather than rural areas. Self Sufficiency Ratio (SSR) which measures an organization’s ability to meet its operational expenses from its own income has been lower than 5% across past four years. This is because VSP’s dependence on external sources in the past four years has been over 90%. External sources includes funds from institutions, foreign sources, and government agencies. Committed donors include SwissAid, ActionAid, America India Foundation, American Jewish World Service, and Women Power Connect. Lack of expertise in social media and other forms of digital marketing. VSP has been grappling with reaching out to individual donors. To address this issue, they have begun considering entering into alliances with fund raising portals. The Board consists of seven board members, all of whom are social workers and hold senior position with other non-profits. Collectively, they bring technical and managerial expertise to the development space. No trustees are related to each to each other. All members meet once every quarter and the quorum is four. However, a democratic approach is adopted when decisions are taken on organizational issues. No member on the Board received an honorarium in FY13. VSP is accredited with Credibility Alliance (Desirable Norms). This accreditation is valid for five years (Sept, 2014 – 2019). Also, VSP is empaneled with Tata Institute of Social Sciences.